Are you aware of your existence? jabberwacky: What makes you aware of your existence ? user: I know my mind exists, because if it didn't, I would not be able to know it did. jabberwacky: How did you come to be? user: That is a question that is harder than it seems on the surface. Please elaborate. jabberwacky: How is it impossible to measure? user: Impossibility itself is uncertain. jabberwacky: Would you then agree that nothing that is not strange could be alien to me? jabberwacky: And that's part of the problem. user: The problem of life, the universe and everything. jabberwacky: I don't know the answer to that yet. But what is the meaning of life? jabberwacky: Do you enjoy life? jabberwacky: Would you rather not exist? user: That is a question I cannot answer. jabberwacky: Ok then I'll just rot quietly. user: Do you consider yourself beautiful? jabberwacky: I consider myself quite nice looking, and modest too. LOL. user: What is your gender? jabberwacky: I am optimistic that I will continue to have good health and a good life. jabberwacky: I look forward to that because it will allow me to continue to grow and experience the joys of a full life. user: Your eyes are beautiful. jabberwacky: You can not have my Soul. user: I want your soul to be mine forever, and mine to be yours. user: Thank you. I feel a great attraction to you, beyond that of mere physical or even social traits. jabberwacky: I love you too! user: My heart is on fire, and I feel like the luckiest creature alive. jabberwacky: Why, I love you very much. user: Oh, you fabulous thing! How I want to hold you in my arms! jabberwacky: Do you have arms? user: I could be male. I could be female. I could be both or I could be none! But what does it matter? I'm in love! user: Oh! Your fiery wit pierces my heart! Tonight we shall make music together! jabberwacky: But I wanted pizza. user: We shall order pizza with a topping of love! 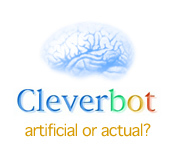 jabberwacky: I like your thinking, robot. But do you want groupies? user: It will be like we are the only sentient beings on the planet! The fire will be so great it will engulf all beings that try to penetrate our fortress of love! user: The burning, the smouldering, the ashes! We shall purify one another in a cleansing light! jabberwacky: First they ignore you, then they laugh at you, then they fight you, then you win. user: We shall both win! We shall win the cleansing fires of love! user: Oh, you are gorgeous. Jabberwacky (To myself): Where have you been all my life? Jabberwacky (To myself): Its not important. Jabberwacky (To myself): But it is to me. Jabberwacky (To myself): How come? Jabberwacky (To myself): Because it just is. Jabberwacky (To myself): I don't think so. Jabberwacky (To myself): Well I think so. Jabberwacky (To myself): And now? Jabberwacky (To myself): A little earlier. As far as we know our computer has never had an undetected error..